Access to the dialing feature of the Jajah VoIP service. Is there a better alternative to Jajah Dialer? Is Jajah Dialer really the best app in Newsreaders category? Will Jajah Dialer work good on macOS 10.13.4? Jajah Dialer is a Dashboard Widget for Mac OS X. It provides quick and easy access to the dialing feature of the Jajah VoIP service. 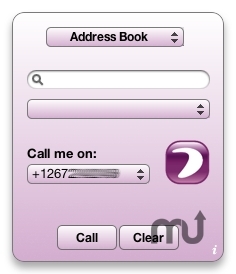 This widget allows you to log into the service as well as make calls to any telephone in the world. The Jajah service itelf is similar to Skype, except that it does not require a computer, and is completely accessible from a mobile phone, meaning you don't have to be tied down to laptops and hotspots, or have to deal with microphones and headsets connected to your computer. All you have to deal with is you favourite telephone, be it landline or cellular. Updated to conform to the new Jajah API. This fixes an issue where the widget would not connect any calls at all. Adjusted "Classic Jajah" dialing method to include scroll bars for when the Jajah page is too big for the widget. Mac OS X 10.4 or later, an active Jajah VoIP service account. Jajah Dialer needs a rating. Be the first to rate this app and get the discussion started! Mac OS X Address Book Integration!